Having plenty of natural light in your home is important. 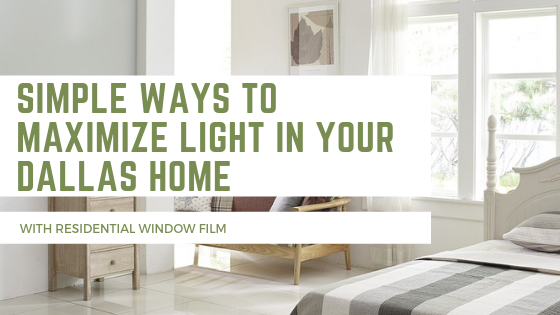 Natural light improves your mood and ability to focus, strengthens your body’s immune system, and creates a soothing, welcoming ambiance for your home. After all, who doesn’t enjoy drawing back the curtains on a bright, sunny day and feeling the warmth of the light on their skin? But the only problem with opening up your curtains or blinds to let in the natural light is that you lose all your privacy when you do so. And when you’re at home, you don’t really want to be on display for the world to see. You want to be able to be yourself, lounge around in your yoga pants or PJ’s, and have fun with your family without worrying about who’s watching. But that doesn’t mean you have to live in darkness just to get privacy. Instead, you can install residential window film for your Dallas home to increase natural light while also creating privacy. Bathrooms need natural light because they’re a small space and they’re also where most people get ready in the morning. You want a good amount of sunlight in order to be able to see well to do your hair, shave, and get suited up for the day. By installing frosted residential window film for your Dallas home’s bathroom windows, you can increase sunlight in your bath and shower area without compromising your privacy. Reflective window films aren’t only elegant, but they’re also a great way to increase natural light. The reflected appearance looks sophisticated and stylish and also helps create privacy that protects you from being seen by neighbors or strangers when you’re at home. Create a bright, welcoming look for your home in Dallas with residential window film. Call our team today to get a quote on installation services.